Like a lot of women, I love jewelry. Whether it be real gemstones and metals or costume jewelry, I am always on the lookout for something new to spice up my wardrobe. Jewelry is one of those things where it doesn’t matter what size you may be. All women can look great wearing jewelry. 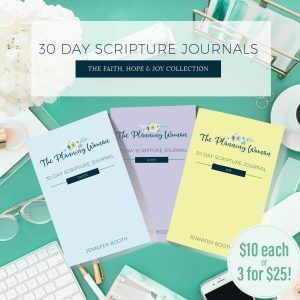 When I was pregnant with my kids, I loved to buy jewelry because it was the one thing that wasn’t dependant on the growing size of my stomach. I had to buy new clothes to accommodate my larger belly and I couldn’t always buy new shoes because my feet were swelling all the time. 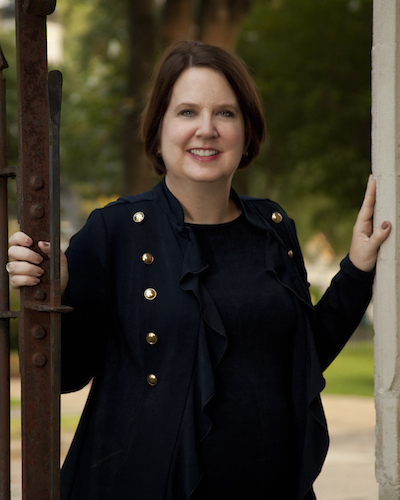 But jewelry…I could buy whatever I wanted and knew I could wear it even after I had my kids. The same is true now as I am on a health journey that includes shedding some weight. I know whatever jewelry pieces I buy now will still work when I get to a smaller size. Because of my great love for all things sparkly, I have amassed quite a collection over the years. And despite going through my pieces several times, I realized a few months ago that I still had way more jewelry than I’ll ever wear. The storage system I had set up was not working either. A few years ago I set up a system that worked well for a while. I put all of my pieces in individual plastic jewelry bags I bought from Hobby Lobby. I then separated them by color and finish and stored them in plastic bins I found from The Container Store. You can see more of that setup here. At the time this worked for me because I had paired down my jewelry quite a bit. However, over time I’ve accumulated more without getting rid of pieces I no longer wear. And having the jewelry in plastic bags still didn’t always help me to see what I had. It got to the point where I had to pull out most of the pieces in the bin where I was searching just to find the one I was looking for. So, a couple of weeks ago, I finally went through all of my jewelry again. I ruthlessly got rid of pieces that were no longer my style or that I knew I would not wear again. 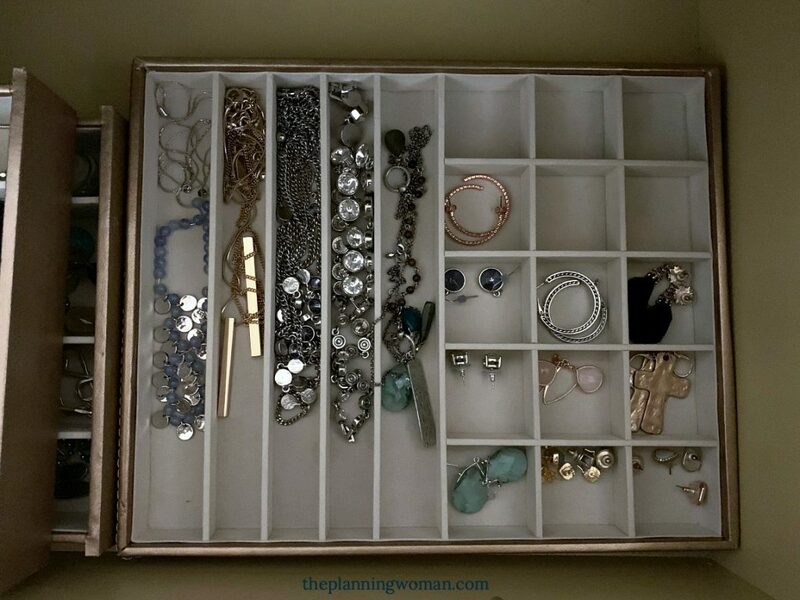 Then I bought new jewelry trays from Bed, Bath & Beyond to organize what was left. 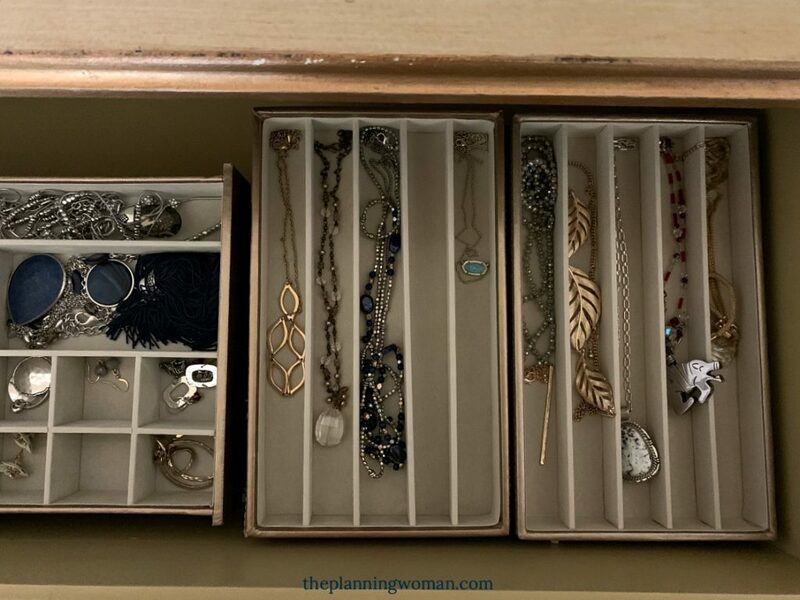 I am still using the same dresser I used for my previous jewelry storage. This is the left-hand side of the drawer. This tray is expandable as you can see. I have two of these stacked on top of each other to hold bracelets, necklaces, and earrings. 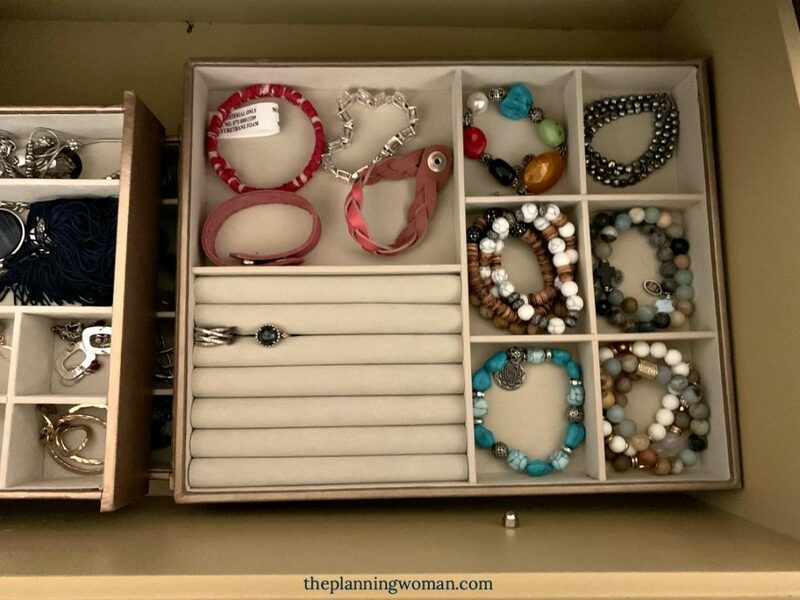 This is the right-hand side of the drawer where I have two smaller necklace trays. They are sitting on top of two other trays which you’ll see below. And, finally, this is the bottom tray on the right-hand side. It holds necklaces and earrings. As you can see, I have room for new purchases. 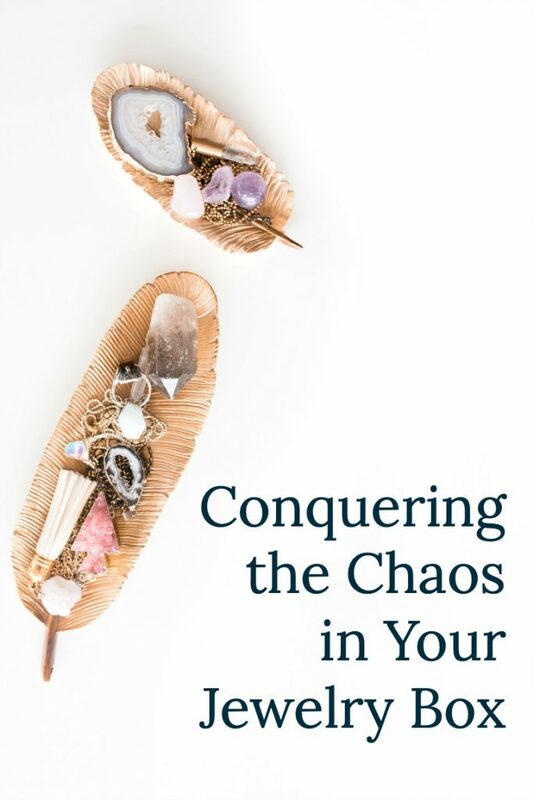 In my opinion, it’s important when you are setting up organization systems that you include some room for growth. I love this setup because I can now see all the jewelry I own. I am wearing multiple pieces of jewelry every day now, not just my wedding rings and earrings. Being able to see my jewelry easily is also helping me to identify what pieces I may need for certain outfits. And, I’m learning that some of the pieces I chose to keep may be going away sometime in the near future. I’m finding that some of them really are not the kind of pieces I want to wear. 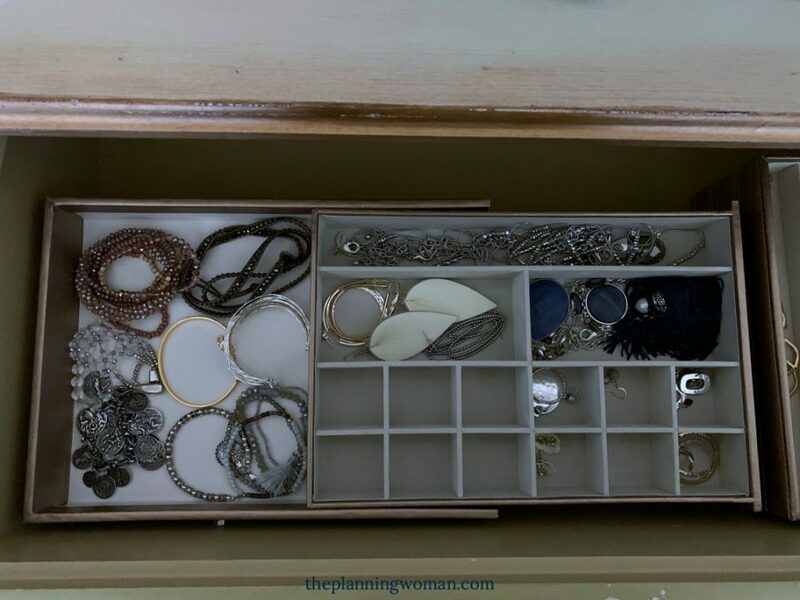 What does your jewelry organization look like?